Customer experience is said to be a top business priority for most companies around the world. Many experts agree that investing in CX establishes a competitive advantage against companies that prioritize the bottom line. While customer experience is a noble and important catalyst for business transformation, becoming truly customer-centric requires an introspective approach. This takes stepping back to define what customer experience really means from the customer perspective, what they truly value and also what’s primed, broken or missing to deliver next generation CX. For example, the organizational infrastructure of many companies is modeled to support the traditional sales funnel. Like the funnel itself, many of the departments designed to support it are compartmentalized. This is why we have silos and why many CX evangelists say that we need to “break down the walls” between them. But, functions such as sales, customer service, marketing, retention, etc., were designed to serve objectives. At the time, those intentions were meant to best serve the customer in those respective stages. The idea and expense of integration was nonsensical in that reach group was funded and measured by how they operated and served customers independently not through integration. To challenge that would often go against the “steady as she moves” or worse, risk averse culture that govern many organizations. The truth is that traditional business models were designed in an era before the consumerization of technology. Customers (and employees) are empowered by technology and by the connections and access social media, mobile and connected devices, etc., facilitate. As a result, the basic premise of how companies sell, serve and support customers now requires new models and methods that meet the behaviors and expectations of a more discerning generation. This is why I believe that one of the biggest trends in business today, digital transformation, is as much about technology as it is about people, operations, processes and perspectives. Digital transformation is the realignment of, or new investment in, technology, business models, and processes to deliver new value to customers and employees in an ever- changing digital economy. In fact, in my research, I’ve found that customer experience is often the greatest ally in digital transformation efforts. Customer experience is not the investment of new front end and back end technology to fix and modernize touch points. Those are acts of CX. Customer experience is human and as such, is defined as the sum of all engagements a customer has with your company in every touch point throughout their lifecycle. Starting with anything other than a customer-first or human-centered perspective is an easy mistake companies often make. Believe it or not, CX is often a technology-led approach. It’s easy to fall into the technology trap though. After all, that’s how much of it is sold. For example, tools ranging from journey mapping to CRM to content management to data and analytics are aiming to help companies integrate and scale customer experience initiatives. But without understanding people, what’s important to them, and how they, and their preferences and values are evolving, businesses are not actually innovating in CX or basing what’s supposed to be customer-centered efforts on empathy or relevance. Work in customer experience starts with the customer’s point of view and considers their intentions, aspirations, challenges, etc., to fix problems and create new value. Since customer experience is the aggregate sentiment and resulting reactions of people in each moment of truth, then all work must focus on delivering consistent, efficient, relevant and meaningful experiences. They must be connected, complementary and seamless. This means that previously separated business units must now cross silos to collaborate, connect back-end processes and systems and design a new kind of customer journey that’s intuitive and efficient for a new generation of connected customers. It’s not easy. This is why digital transformation is often led by CX. Great CX reverberates across the enterprise. Some of the most advanced companies I’ve studied invest in CX with a human-centered point of view to give technology and operational investments purpose. The direction each business takes in pursuing change is complex, and there is no one way to excel. Nor is there one tell-all anecdote, framework or app to map the journey of your next steps toward programmatic transformation. Rather, companies that succeed do so by taking an empathetic approach. They also seek executive sponsorship to support the formation of a cross-functional steering committee to 1) find critical missed opportunities, 2) fix what’s broken or causing friction and 3) identify areas for immediate and long-term innovation, 4) develop a roadmap for CX and 5) guide the company’s digital transformation. The framework offers insights and new understanding of technology, data and the connected customer. By learning from these companies and following the OPPOSITE approach, digital transformation and all the work, resources, and plans around it becomes identifiable, approachable and attainable for organizations. Orientation:Establish a new perspective to drive meaningful change. People:Understand customer values, expectations and behaviors. Processes:Assess operational infrastructure and update (or revamp) technologies, processes and policies to support change. Objectives:Define the purpose of digital transformation, aligning stakeholders (and shareholders) around the new vision and roadmap. Structure:Form a dedicated digital experience team with roles/responsibilities/objectives/accountability clearly defined. Insights & Intent:Gather data and apply insights toward strategy to guide digital evolution. Technology:Re-evaluate front and back-end systems for a seamless, integrated and native customer (and ultimately employee) experience. The OPPOSITE framework was designed to visualize your work building toward digital transformation and reshaping the customer experience. It’s also meant to help create alignment among different stakeholder groups to drive a larger, more unified movement in the modernization and, in some cases complete innovation, in business dynamics and models. For companies looking to align their CX efforts with customer preferences, behaviors and values, look beyond your existing infrastructure and processes to unite stakeholders across the organization, create a shared vision, develop an innovative experience architecture and roadmap and take more meaningful steps towards thriving in the new digital reality. The post Human-Centered CX: Uniting Stakeholders Across the Enterprise to Deliver a Relevant and Holistic Customer Experience appeared first on Brian Solis. Sprout’s recent message tagging update provided users with a robust set of tools for organizing inbound and published messages from Sprout’s Smart Inbox or Compose. Today we’re excited to introduce the Tag Report. This feature rounds out our message tagging toolset and creates an end-to-end tag management system. With the Tag Report, social media managers can analyze the effectiveness of tagged messages with insights on volume and performance patterns. The new Tag Report provides a summary of messages tagged from Compose and in the Smart Inbox. The report offers a comprehensive breakdown of each tag so you can quickly understand message volume and how your team is applying tags. 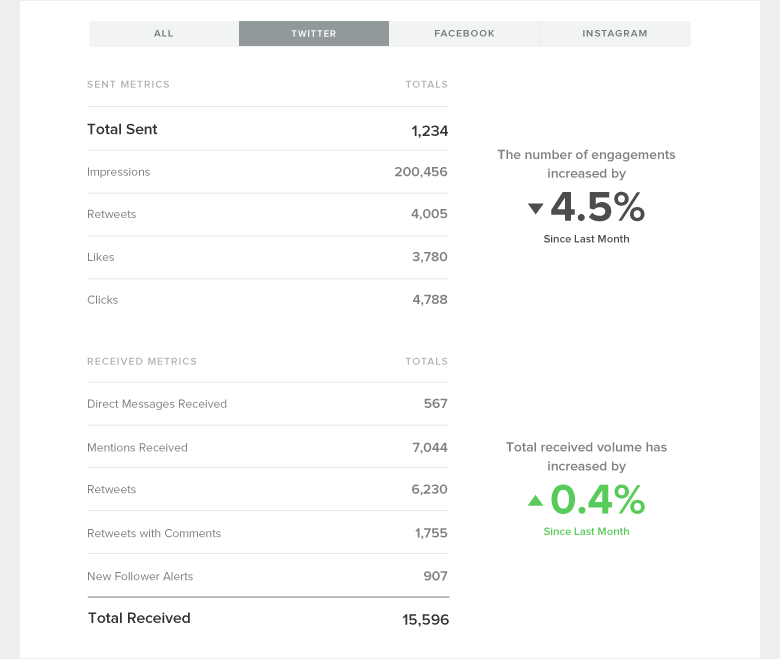 If you’re using tags to categorize published messages, the report provides engagement metrics. If your team is primarily using tags to organize incoming messages in the Smart Inbox, the report provides a breakdown of received metrics. You can also use the network filters to toggle between data for Twitter, Facebook, and Instagram. Sprout’s message tagging system was designed to fit a myriad of use cases ranging from measuring campaigns to understanding brand sentiment. How the Tag Report can compliment your social strategy is dependent upon how your team is currently using message tagging. Below, we’ve outlined two common ways marketers are using message tagging and how the Tag Report can help support each effort. Your team can use the Tag Report to measure inbound and outbound messages that are associated with a specific social campaign or promotion. For instance, let’s say you’re a retail brand that runs a social campaign around a summer promotion. From Compose your team can apply specific, campaign-related tags to outbound messages. This same tag can be applied from the Smart Inbox to inbound, campaign-related messages. 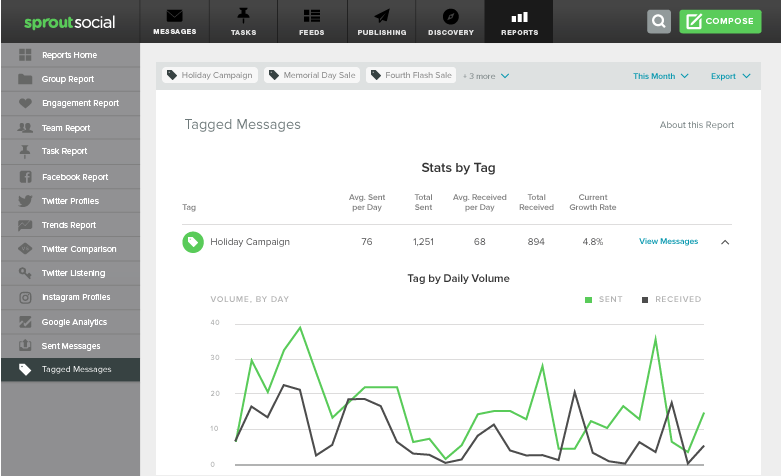 The corresponding tags will help your team organize related messages and analyze the success of your campaign. 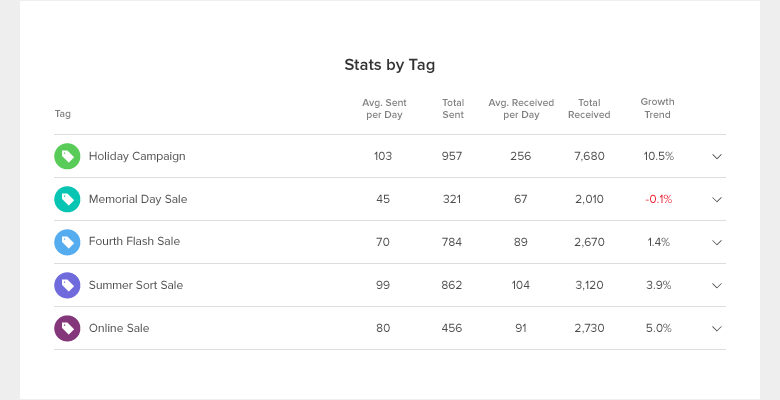 Your team can use the Tag Report to dig into the metrics and compare tags by volume or engagement metrics such as impressions or Likes. This will help you gauge participation and make informed, strategic decisions in the future. Analyzing brand sentiment is important, especially when it comes to the messages fielded by your business’ social customer care team. Your team can use Sprout’s message tagging feature to keep track of pre-emptive, proactive and reactive communications. To understand how your audience feels about your services, products or updates, apply sentiment-based tags to incoming and support-related messages. Then use the Tag Report to understand message volume and which tags are commonly used together. These findings can support your future customer care efforts. To learn how your team can utilize Sprout’s message tagging to its fullest potential, download our guide. The release of the Tag Report enables teams across your organization to categorize, organize and analyze social messages. Whether you’re using tags to keep track of your social media marketing efforts, social customer care initiatives or for campaign management, the Tag Report can help your team make better informed business decisions. This post Introducing the Tag Report: Analyze Performance Across Your Tagged Messages originally appeared on Sprout Social. Being a curious person by nature, I decided to do some data mining—some email deliverability data mining that is. I was interested in looking at different industry verticals and how they perform against some key benchmarks. I wondered if there was much difference across different verticals in regards to deliverability. While I was not surprised by the findings, there were certainly some interesting conclusions to be drawn from the data. The total number of campaigns monitored over the 90-day time period. The percentage of campaigns that had more than 90% inbox placement. The percentage of campaigns that had greater than a 30% read rate. The percentage of campaigns that had a volume of 60 thousand or more. The benchmarks that I chose were on the high end of expectations and I did that on purpose to look for high (or low) performers. I wanted to know for example, which of these verticals was sending out messages that were actually being read at a nice clip (thus the high 30% number) and had good deliverability at 90%+. I also pulled out campaigns of > 60 thousand recipients. I wanted to see if certain verticals were sending more individualized campaigns vs. batch and blast types to larger audiences. Financial Services had the best inbox placement, by far the best read rate, and interestingly enough the most large campaigns. It seems like most of the “batch” campaigns were actually what we would look at as more transactional in nature, but they batch them together. It makes sense that emails dealing with finances are something that people pay attention to. Retail was pretty surprising to me in a few ways. It has the lowest inbox placement, read rates, and the smallest percentage of batch and blast campaigns. I would guess that a lot of these numbers are simply due to customer fatigue. There are so many emails from retailers that it’s inevitable that a lot of our messages get lost in the shuffle. I expected Health and Wellness to be more difficult to get to the inbox, but it performed basically on par with the Retail vertical. There were fewer reads and more batch and blast. This is one of those more challenging verticals because of the large amount of spammers that cross into this vertical. There’s also a real chance to stand out in this vertical if that’s where your company plays. Great packaging and content in an email truly can make a real difference in bringing eyeballs to your message. I see this vertical as one I will be watching in the future. Pushing the envelope with email campaigns could really help marketers stand out in this crowd. The last group I looked at was Political Parties and Organizations. I couldn’t resist taking a look at this one with everything that’s going on. Probably no surprise, but the PP&O group almost doubled the number of campaigns over the past 3-month span. No real surprise with the volume but we see the trail of email fatigue. It starts with the lower read rates and not fantastic inbox placement. I would expect these numbers to continue to go down over the next 6 months. I’ll be tracking some of the industry verticals and reporting back to you from time to time. I like comparing these categories because so many marketers are looking for a reliable benchmark with which you can compare yourself to. That’s always been a difficult question, because email programs (and companies they represent) are different. In the meantime, download and read the Email Deliverability: Guide for Modern Marketers to strengthen your current deliverability process. Check back in for more of my data mining reports soon.